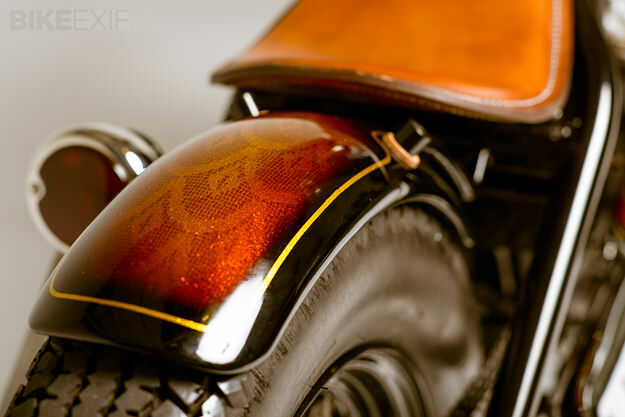 Atom Bomb’s Clay Rathburn is known for his beautifully crafted custom Triumphs. 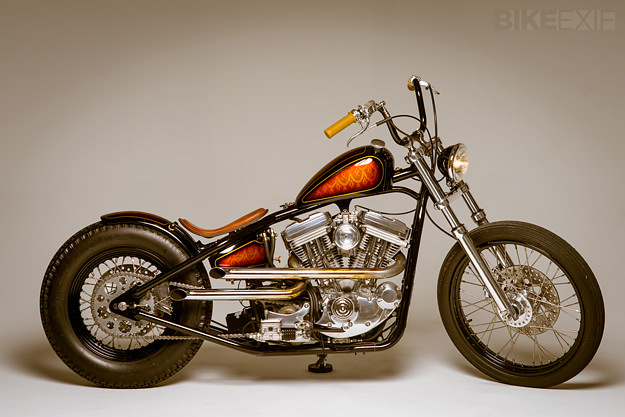 But the latest bike to roll out of his Richmond, Virginia workshop is this Harley-Davidson Sportster 1200. 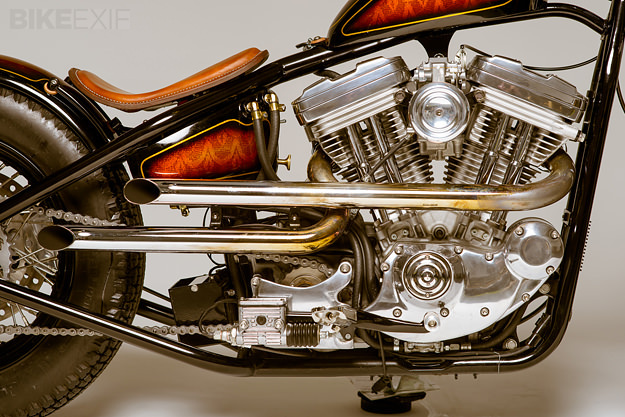 It’s not our usual fare, but the style and detailing on this build is hard to ignore. The Sportster 1200 was mostly stock when it rolled into the Atom Bomb workshop. Rathburn added the rigid rear section—with a 4” stretch—and reconfigured the stock rear caliper to work with the new frame. He then powdercoated and re-laced the stock rims onto polished hubs. The motor is mostly stock but upgraded with a Dyna ignition and a Mikuni carb. The top end has been freshened up, and the black powder coating was stripped off the motor. Rathburn custom-fabricated the exhaust in-house and fitted an air cleaner from Boyle Custom Moto. 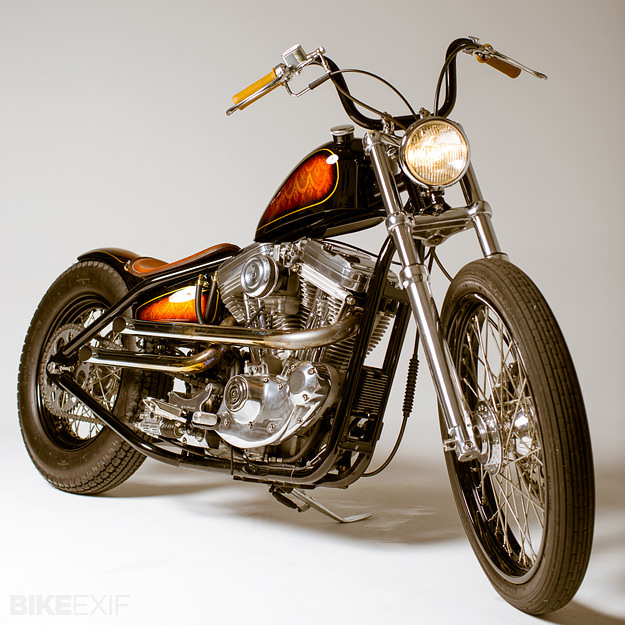 The front fork is a 39mm Narrow Glide shortened by two inches and shaved and polished. “I also swapped out the front brake caliper with one from a newer Sportster, just because it had cool fins on it … and polished it, of course.” Less obvious is the tweaking to the front of the frame, with the stamped sheet metal gusset removed and new motor mounts installed. The oil bag is hand formed aluminum, the fuel tank is a heavily reshaped early Sportster item, and the seat is from Red Tail leather. 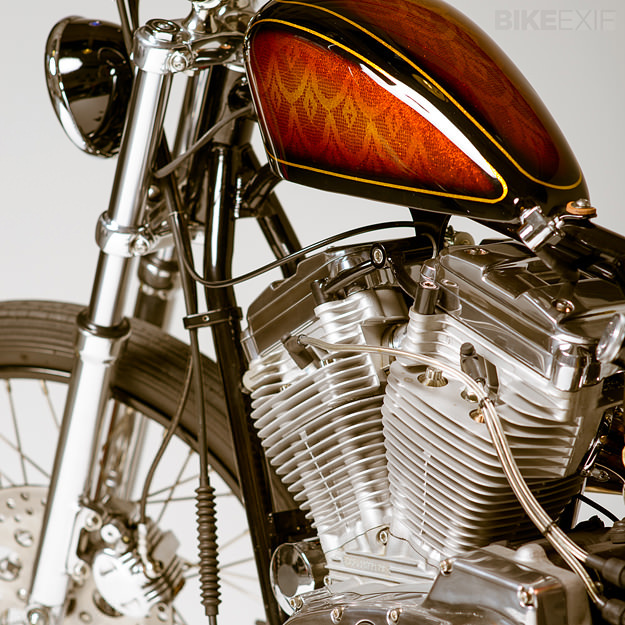 Lowbrow Customs supplied the hand controls; the foot pegs, risers and bars came from Biltwell. Rathburn does all his powder in-house, but Fred Pinckard at Fulton Paint Works did the immaculate paint.